Mobile Camp is a highly effective way to reach kids who ordinarily would not have a camping opportunity. We feel it is a wonderful prevention service and youth diversion program that enriches our county by teaching new skills and building healthy relationships in at risk neighborhoods. Mobile Camp is a partnership between the Black Hawk County Sheriff's Office, Quakerdale, and several other service organizations. It is a week-long day camp that serves up to sixty (60) children ages 6 to 11 and travels directly to the needy areas. There is no cost to the children or families served. The program unites youth with community members to help keep the kids off the streets. The program custom fits the specific needs of the community served. 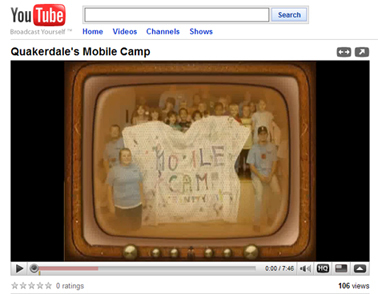 Mobile Camp is a service founded by Quakerdale, a private not-for-profit social service agency in Iowa. Quakerdale provides preventative and therapeutic services to youth and families. Quakerdale is licensed by the state of Iowa and are accredited by the council on Accreditation for Families & Children, Inc.
2009 Mobile Camp for your viewing.